Model F01571, single lift 1.500 kg capacity and 915 mm high. 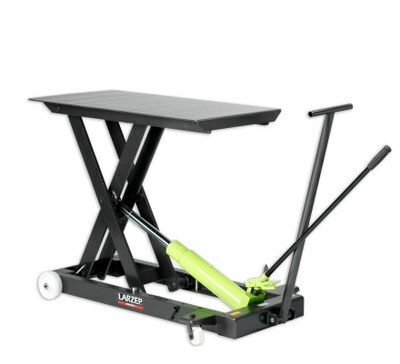 A foot pedal is fitted to advance the lifting table quickly to the load contact. The operating handle is then used to lift the load. Special lowering valve means that the process is safe and controlled. Overload safety relief valve. “T” operating handle facilitates easier operation. The table can be locked at different heights with safety pins. Strong steel platform, 1.000×500 mm area. The frame is in accordance with lifting table security standards.